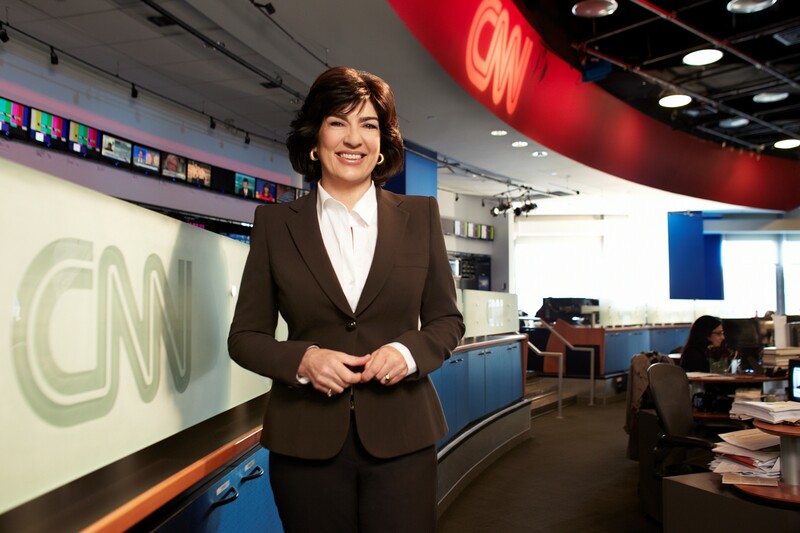 Christiane Amanpour will host a new daily foreign affairs programme on CNN International that will launch on Monday 16 April, it was announced today. Beginning with the programme’s launch, the 30-minute daily broadcast of ‘Amanpour’, will air weeknights at 2000 BST, and replay at 2200 BST. “We are delighted to have Christiane back at CNN,” said Tony Maddox, executive vice president and managing director for CNN International. “Christiane’s sophisticated, incisive journalism is needed now, more than ever to add context and depth to the world’s biggest news and stories,” Maddox said. In the unique relationship announced in December, Amanpour’s primary role is as global affairs anchor for ABC News blazing a trail in international reporting for American viewers, in addition to her new programme on CNN International reaching a vast global audience. She will continue her courageous reporting in war-torn countries for all ABC News programmes, platforms and online, including her unmatched ability to land major and rare exclusive interviews with world leaders – including last year’s only interviews with Moammar Gadhafi and Hosni Mubarak. As global affairs anchor for ABC News, her ongoing assignments range from the uprisings in the Middle East to Iran’s nuclear program to the Eurozone crisis. Amanpour will also report on new conflicts, natural disasters and humanitarian crises, anchor four primetime specials on ABC and continue ‘Around the World with Christiane Amanpour’, her recently launched video series for ABCNews.com and Yahoo News. “This is an exciting time to have this unique role,” Christiane Amanpour said. “I am thrilled to come home to CNN, where I have reported for so many years – and combine this role with the reporting that I will continue for ABC News. Viewers in America and around the world recognize that we live in a globally-inter-connected world – from the ‘Arab Spring,’ to the economic challenges faced by Europe and theU.S., to security challenges everywhere. We are all in this together. And, we will look at all of these events and the people moving these events, from all angles, without fear, nor favour,” she continued. Following that, she executive produced CNN’s ‘In the Arena’. Prior to joining CNN, McGuirk was a producer with CBS’ ‘60 Minutes’. “Our ambition with this programme is to present world leaders as well as fresh voices on the major issues of our times, utilising Christiane’s experience and passion for international journalism,” said McGuirk. “The year 2012 is also an historic election year for so many nations – the U.S., Europe, and the Middle East – and, the ‘Arab Spring,’ the Occupy movements, the potential resolution for the war in Afghanistan, all make this a fascinating time in our history, and for developing a program like this one,” McGuirk said. As a companion digital presence to the programme, CNN will also launch www.Amanpour.com Users of www.CNN.com/international and www.Amanpour.com will be able to view excerpts of the daily broadcasts of ‘Amanpour’. www.Amanpour.com and www.CNN.com/international will have editorial contributions from Christiane Amanpour, the show team, and in-depth insights and commentary from a wide array of foreign policy experts. Additionally, viewers and users can interact with ‘Amanpour’ via Twitter and Facebook for show guest updates, breaking international news, and more. And, Christiane Amanpour herself will curate a daily dose of the most vital digital content that she is following to stay connected with the pace of change for the day’s top stories. ‘Amanpour’ show social media feeds will be available in both Spanish and English languages. Also on 16 April, CNN International will launch ‘CNN NewsCenter’, a half-hour news programme that will air weekdays 2030 BST. ‘CNN NewsCenter’ will provide viewers with a complete picture of the day’s global news. ‘CNN NewsCenter’ will continue the editorial pace set by ‘Amanpour’, and offer the latest updates and frontline perspectives on stories that matter to CNN International’s viewers around the world. Sesay, who also appears daily on ‘Anderson Cooper 360’, will bring a passionate and experienced voice to the programme.